Our raspberries are nearing the end and this is one of the recipes I have been making to use them up. You don't need an ice cream maker, which is good because I don't have one.... yet. 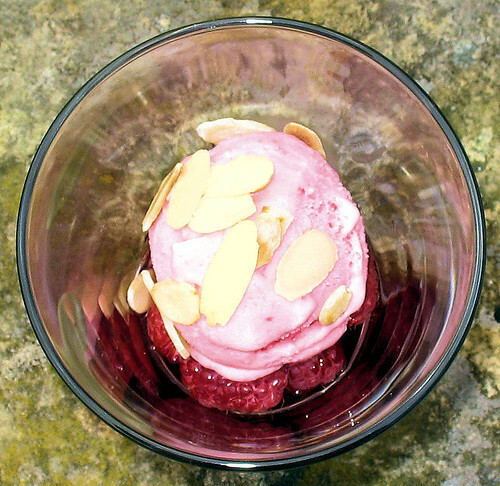 Frozen raspberries can also be used if, like me, your freezer is groaning with them. You really get two recipes for one here, as the first 4 ingredients make a delicious raspberry sauce, just leave out the cream and add the sugar gradually to taste - you don't need the full amount. This is also my contribution to For the Love of Ice Cream Challenge, which is being hosted by Yum Sugar. Puree the raspberries in a blender with the lemon and orange juices, then sieve into a bowl. Add the sugar, stir and chill for about an hour. Whip the cream until if forms soft peaks, then stir in the raspberry puree. Turn into plastic container and cover and freeze for about an hour, after which it needs to be taken out, stirred and then frozen again until solid. Meanwhile, soak the raspberries in the liqueur. 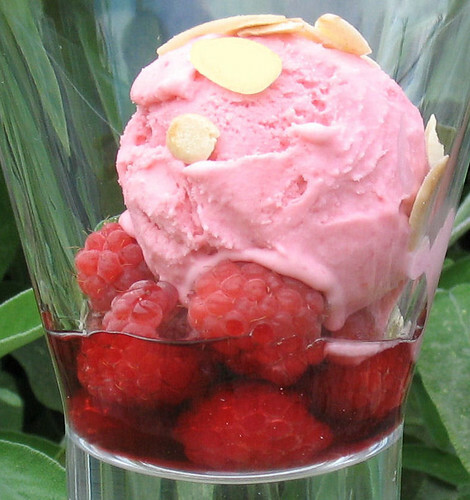 Spoon the raspberries into 4 glasses and scoop the ice cream on top. Note: Recipe can be easily halved. That looks delicious Nic! You've been holding out on me!!! Looks so pretty and you just know that it tastes good.